A professional scaling and polishing will result in a clean mouth and fresh breath. But plaque will start building up on your cat’s teeth within hours after cleaning. Within days, the plaque will harden into tartar that cannot be removed without another professional cleaning. How can you help prevent this? By providing dental home care for your cat. Tooth brushing – This is the best option for slowing down plaque formation. It needs to be done at least every other day to do any good. Water additive – Healthy Mouth is a water additive that reduces plaque build-up by 80%. If your cat regularly drinks water out of his bowl, this is an effective and easy dental home care option. 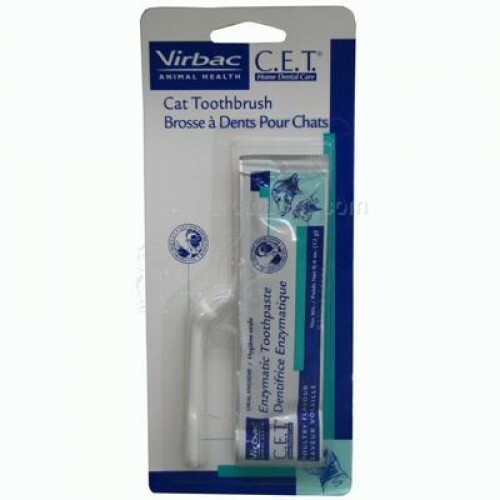 Dental treats – There are many dental treats out there, but the only brand accepted by the Veterinary Oral Health Council as effective are Feline Greenies Dental Treats. 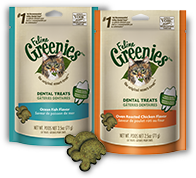 Some cats that will not allow brushing or drink Healthy Mouth will happily eat Greenies. We sell all of the above products at the clinic and can teach you how to use them.